Looking for a Good Reason to Resell Dynamics 365 with SherWeb? Here are 8 reasons you can't ignore. You've probably looked at different Cloud Solution Providers (CSP) and asked yourself which one can make it easier for you to do business in the cloud. Not all CSP partners are created equal. 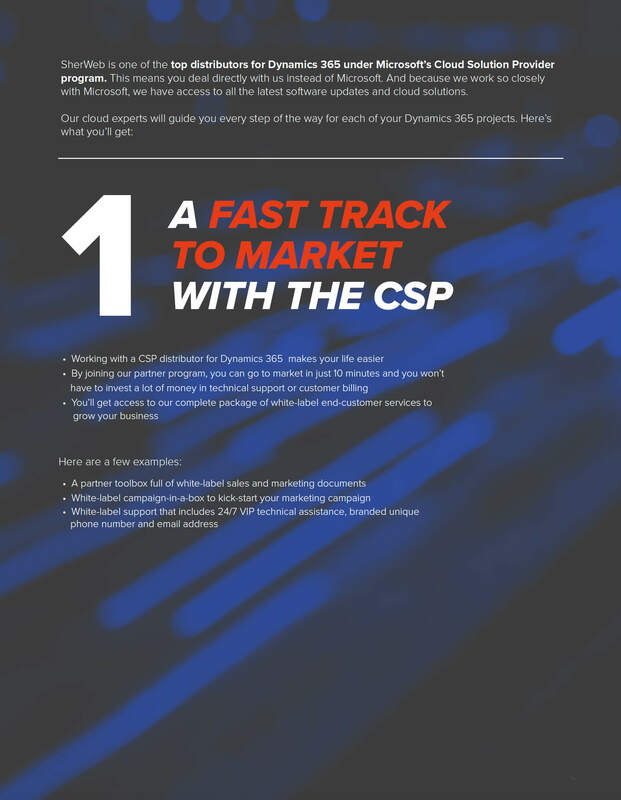 Find out how a top CSP distributor like SherWeb can give you better access to the Dynamics 365 market, exclusive access to a community of expert for all your projects and much more. Thank You! Check Your Mailbox for the Document. Join our partner program and be ready to go to market with Dynamics 365 in just 10 minutes. Don't worry about investing in technical support or billing. Use our partner portal to purchase, provision and bill your customers' products from one central location. Get help for your Dynamics projects from our customization experts. Work with an Account Manager who really understands your business. Use our free on-demand training to sharpen your sales strategy. All resellers get access to our partner toolbox, which is full of white-label sales and marketing tools.